You hang up the phone and you think that mom seems fine. On your next cross country visit, you realize she isn’t fine. The house is not fine. Her health is not fine. She is frail and unhappy, but she has been hiding it on the phone all these months. Now what? If your parent is cognitively impaired, then you may need to step in to make the difficult decisions about their health and safety. This may be unavoidable in some cases of Alzheimer’s or other forms of dementia. But if you are the adult child to an aging parent, here are a few tips on how to handle the role change as you become the caregiver for your loved one. They may be less capable of living on their own, but they still deserve to maintain their dignity. Make peace with the new reality. The first step is to accept that there will be challenges as your parent becomes more frail, less mobile, and less independent. Use patience and kindness with them and with yourself. Even some of the most educated professionals in the field of health care or aging, still have a difficult time when it comes to their own parent. We all may feel some sense of denial. But the sooner you accept the reality of their health and safety, the better you can plan for their care. Seek support. Often times, caregivers feel very alone. But this is not something that you need to do, nor should you do on your own. Caring for a parent can take a financial, physical, and emotional toll. You need a strong support system to be there for your loved one and to pick you up when you need help. If you don’t have a large network of friends or family to support you, then you can look for a professional therapist, online resources, or organizations and groups in your local communities. The most difficult thing to understand is your new role as a caregiver to your parent. Seeking the support of others, who have gone through or are going through this process, can be immeasurably helpful. Many caregivers find a lot of hope and relief when sharing their experience with others. Take charge, without taking over. 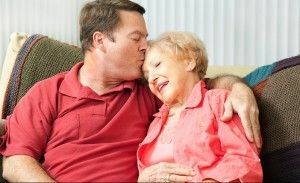 Caregiving for your parent may be an opportunity for you to give back to your mother or father, who gave so much to you. But they are not your child and should be given the respect and dignity that they deserve. Remember, many parents may be afraid to ask for help for fear that they may lose their independence completely. Become a team. Determine what their needs are and assist where you or your family members can or find the resources to help them. Strive to have two-way conversations about how they wish to live and what makes the most sense for their health and safety. No one wants to be told what to do. Why would your aging parent be any different? Involve them in the planning and decision making process. This may not always be easy, but try to honor their wishes. Love, laugh and learn whenever you can. Your parents hold years of memories, experience, and wisdom. Take every opportunity to really listen to them and talk. Every day is precious. Dance to their favorite music, watch a funny movie, laugh about embarrassing moments, and share stories. Days will be hard and times can get tough, but strive to find some humor, positivity, and joy in the peaceful moments for their sake and for yours.